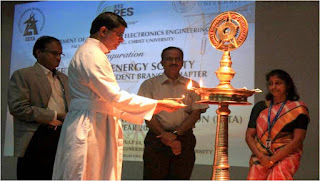 The inauguration of the IEEE-PES Student Branch Chapter under the Department of Electrical & Electronics Engineering of Faculty of Engineering, Christ University was conducted on Wednesday, 13 July, 2016 at First Block Auditorium of Faculty of Engineering. The Program began at 10. A.M in the presence of Mr. Sethuraman Ganesan, IEEE PES Banglore Section Chair, Dr. Balaraman Kannan, IEEE PES Banglore Section Vice Chair, Rev. Fr. Benny Thomas, Director, Faculty of Engineering , Ms.Nirmala John, Electrical & Electronics Engineering Department Co-ordinator and Dr. S. Suganthi, IEEE Student Branch Counsellor. 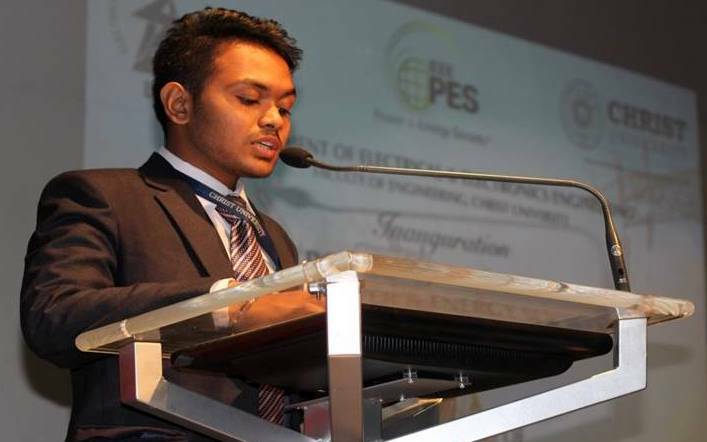 The Events began with an Invocation dance by the IEEE-PES student members. This was followed by Lighting of the Lamp by the dignitaries and the student representatives. Ms.Nirmala John, Electrical & Electronics Engineering Department Co-ordinator welcomed all the dignitaries and other faculty members and IEEE delegates who had come and graced the occasion. Rev. Fr. 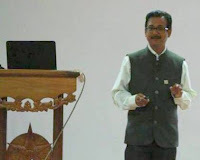 Benny Thomas, Director, Faculty of Engineering delivered the Presidential Address wherein he emphasised on the need for inculcating virtues and ethics in life which would enable us to be good and responsible engineers. 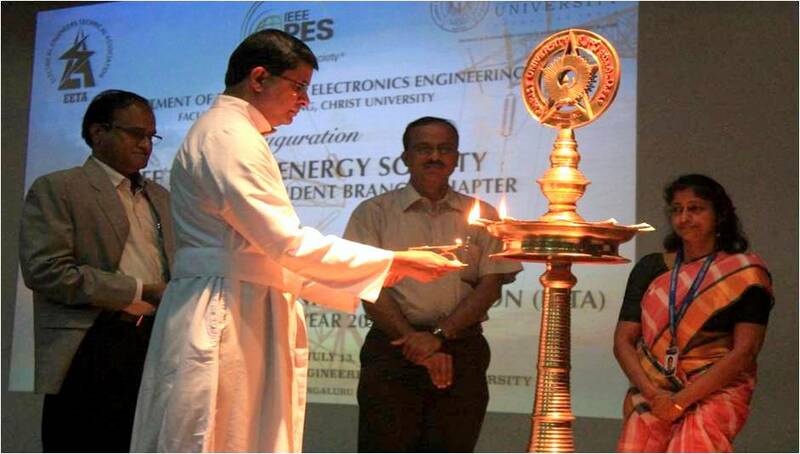 This was followed by the Introductory Remarks on PES by Mr. Parag Jose, Faculty Advisor , IEEE-PES SB. The speaker highlighted the benefits of being an PES member and the role of PES in shaping the future. Mr. Sethuraman Ganesan, IEEE PES Bangalore Section Chair during his inaugural address highlighted the role of IEEE and IEEE-PES in making a better world. 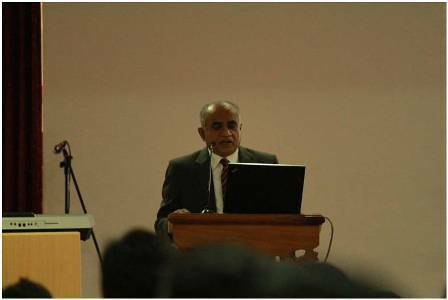 The birth of IEEE-PES, the growth of IEEE-PES and the activities and achievements of IEEE-PES Banglore section was highlighted by the speaker. He also invited the IEEE-PES members to be participants in Workshop on Energy Analytics to be held at IISc, Bangalore on 23rd and 24th September 2016. 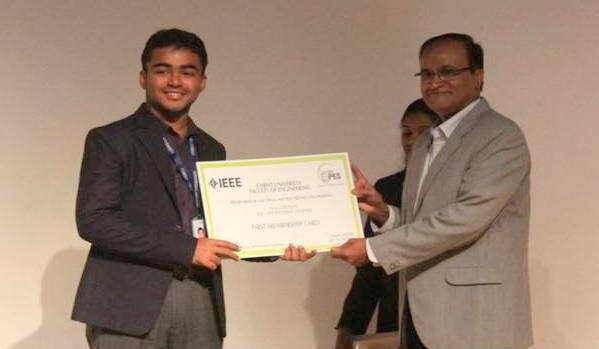 He also invited the members to be volunteers for the IEEE-PES Bangalore Section Flag Event, Ninth Annual Asia-Pacific Power and Energy Engineering Conference (IEEE PES APPEEC 2017) to be held in 2017. This was followed by the handing over of First membership card by Mr. Sethuraman Ganeshan to IEEE-PES Interim Chair Mr. Arka Pramanik, a student of Fifth Semester B.Tech in Electrical & Electronics Engineering. Dr.S Suganthi, IEEE SB Counsellor handed over the badges of responsibility to the office bearers of IEEE-PES SB. The Chair, IEEE-PES SB, Mr. Mangot Sreejish then delievered the Vote of Thanks, thanking the dignitaries, the faculty members and students who took great effort in making the event a grand success. Then the Inauguration concluded with Christ University Anthem. Dr. Balraman Kannan, IEEE- PES Banglore Section, Vice- Chair delivered the keynote address.The session started with introducing the changes happening in the energy sector, especially with smart techniques. On the History of sciences, the speaker explained Kondratieff cycles, where technology innovations led to economic growth and a period of recession before next great innovation. In the history there were cycles propelled by Steam engines, railways, electricity, chemistry and IC engines, petrol, plastic and electric motor, IT, biotech and new materials. The first, second and third industrial revolution periods are seen during the periods 1760-1850, 1890-1944, 1990-2040. The speaker further added that technology has transformed the way the things are perceived every time in the history. Today’s industrial revolution is leading to distributed capitalism than monolithic structure. Energy is becoming more democratised as all the consumers are acting both as producer and consumer or act as a ‘prosumer’. The main pillars in democratization of energy are renewable energy, energy buildings, hydrogen storage, intelligent grid, fuel cell vehicles.New energy systems with new communication techniques offer great economic transformation –which is the key in third industrial revolution. Future grid is more secure with better communication and total control. The grid becoming digital with lot of devices and communication protocols.Continentalization of energy has become a reality today. The entire European grid is integrated to form a single grid, where country borders are fading away. This enable the countries to utilize the excess energy during the peak demand seasons from other countries where the energy requirement is less during the season due to the difference in weather conditions. The details of the proposed Asian super grid was also given by the speaker. He also gave insights to digitization of manufacturing, Class room makeover, virtual reality etc. The session concluded with a question answer session, where Dr. Balaraman Kannan answered the questions from the audience. 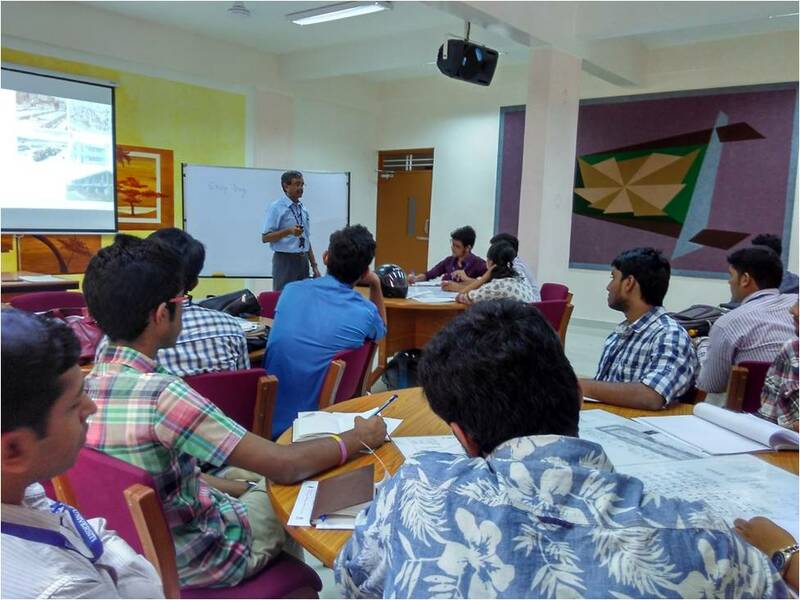 The Department of civil engineering, in association with Civil Simplified of Skifi Education Labs Pvt Ltd organized a work shop on Transportation Engineering for the 3rd year B.Techstudents on 25th and 26th August 2016. The workshop was handled by Mr. Satadru. 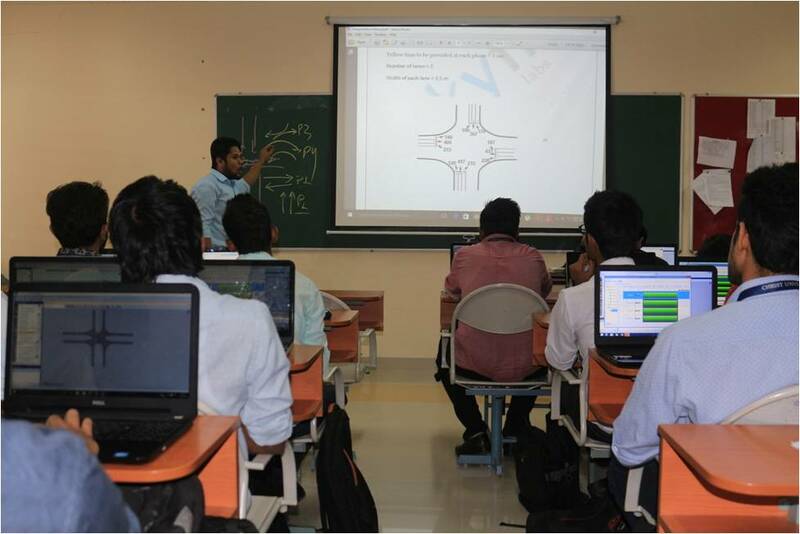 The students learnt the concepts of traffic flow and signal design. 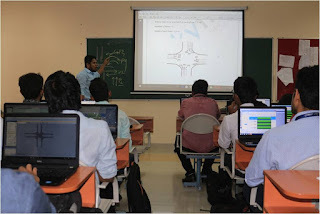 Once the theory session was concluded, students used industry based simulation software to analyze the traffic flow of a real junction in Bangalore by obtaining data from Google map. 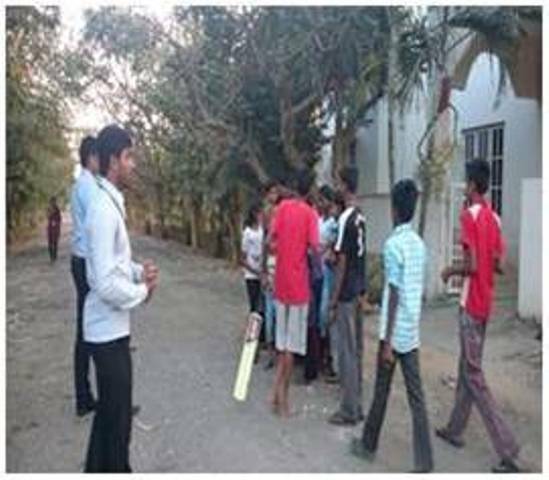 The students then learnt how to design a traffic signal system using the tool. Students expressed their enthusiasm in designing the signal system and appreciated the workshop whole heartedly. 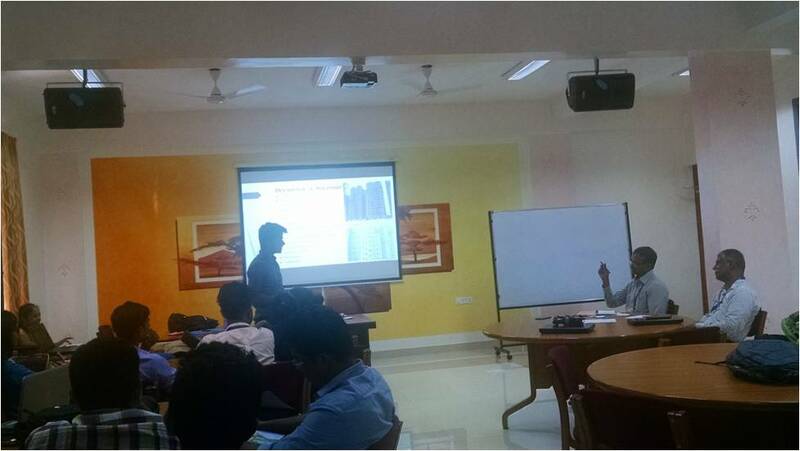 The Department of civil engineering, in association with Civil Simplified of Skifi Education Labs Pvt Ltd organized a work shop on construction project management for the Final year B.Tech students on 25th and 26th August 2016. 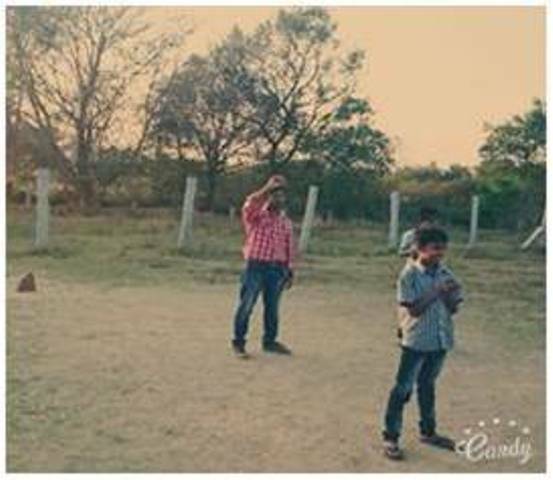 The workshop was conducted by Mr. Vasanth. The students learnt the fundamental concepts of construction management and its importance in the field of civil engineering. 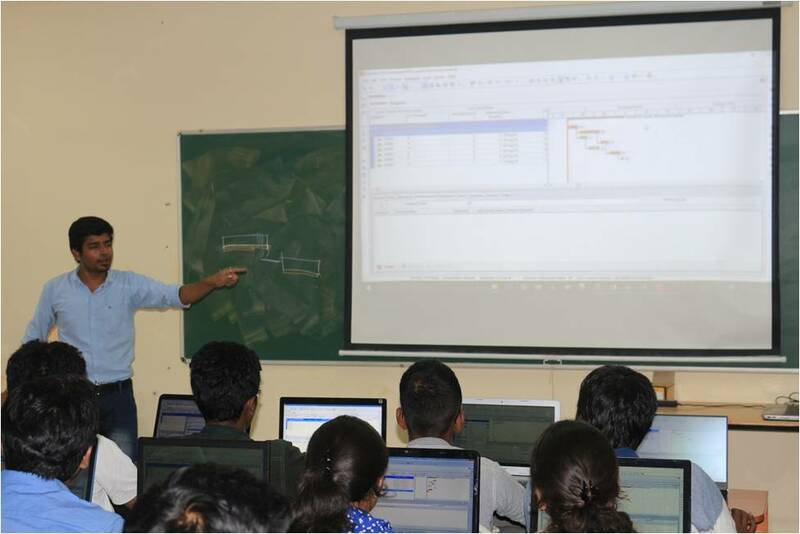 The students underwent a hands on training session in developing a timeline of a project, calculating critical path etc., using software PRIMEVERA. The Workshop was highly appreciated by the students as it gave the graduating batch a very good insight about how the construction project is scheduled. 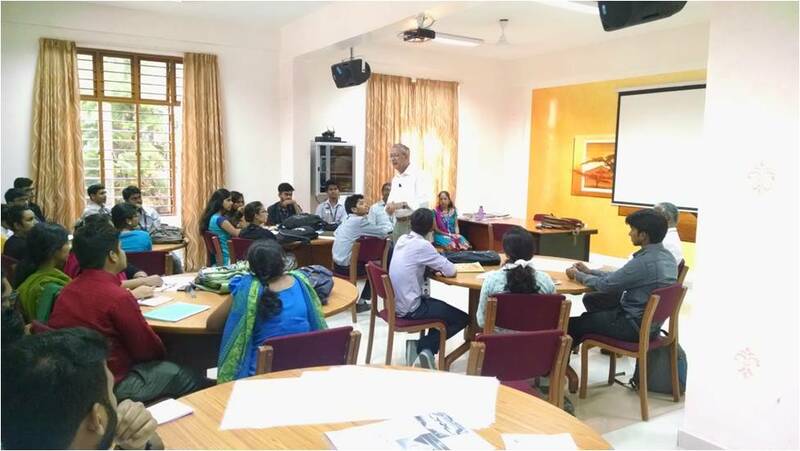 The Department of civil engineering, in association with Civil Simplified of Skifi Education Labs Pvt Ltd organized a work shop on bridge design, fabrication and testing for the 2nd year B.Tech students on 25 and 26 August, 2016. 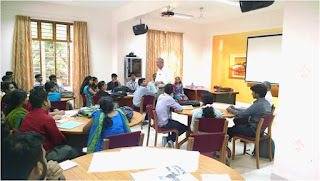 The workshop was conducted by Mr. Niranjan Yadav. 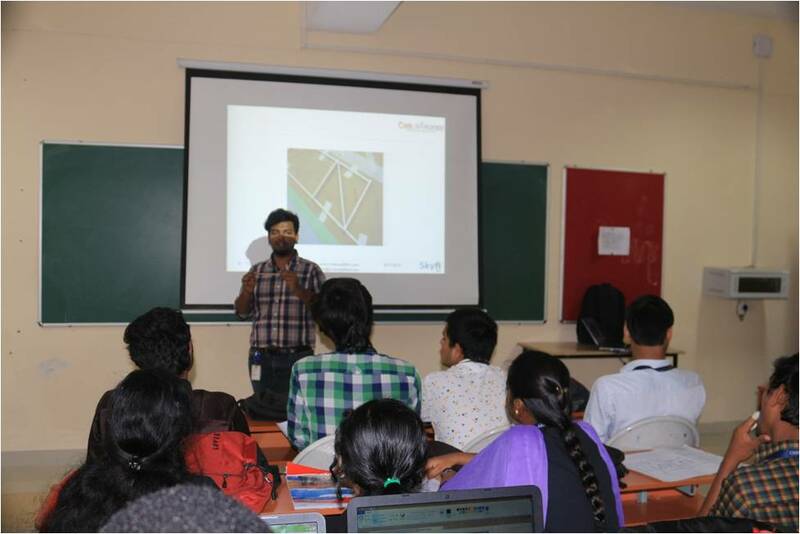 The students learnt the fundamental concepts of bridge design and basics of analyzing a truss bridge. 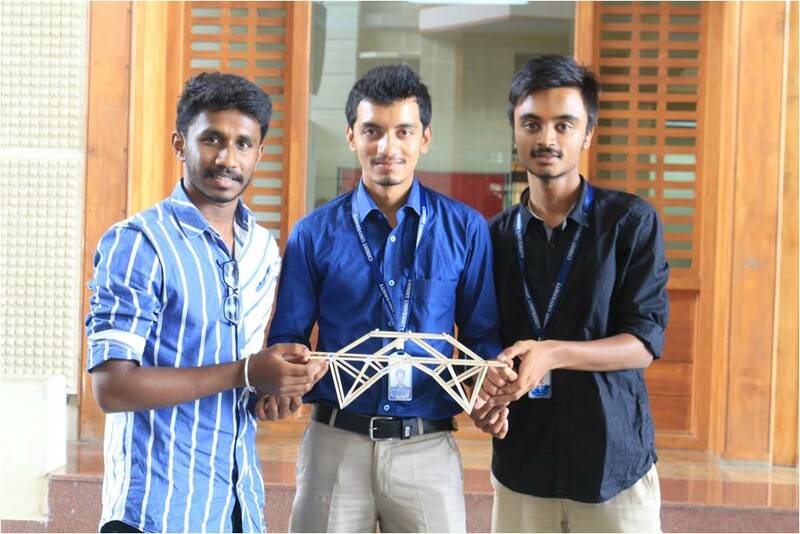 The workshop was highly interactive, which gave the students hands on experience on designing, fabricating and testing the bridge which the students modeled by balsa wood. The students highly appreciated the workshop. 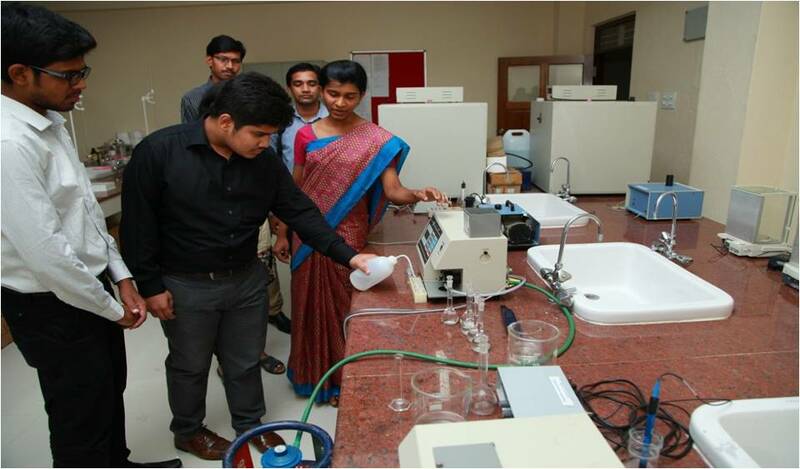 The department has excellent laboratory facilities with latest and new equipment. We have well trained laboratory staff assisting our highly qualified and experienced teaching faculty in conducting the labs. There are nine laboratories in the department out of which seven laboratories are for academic purpose these are Material Testing Laboratory, Survey Laboratory, CADD Laboratory, Applied Engineering Geology Laboratory, Geo-technical Engineering laboratory, Concrete Technology Laboratory, Highway Materials Testing Laboratory, Environmental Laboratory and Structural Dynamics Laboratory,theother two laboratories used for academic and research purposes these are Concrete Technology Laboratory and Environmental Engineering Laboratory. 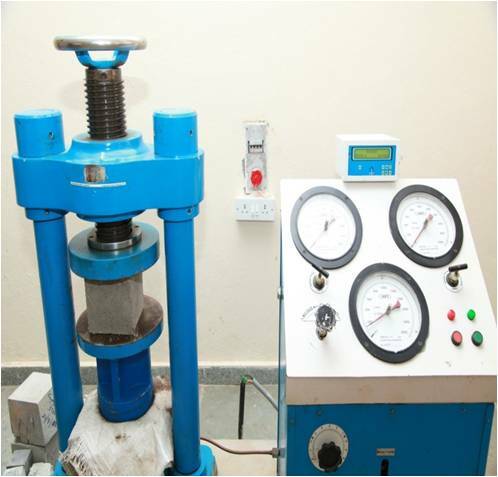 Basic Material Testing Laboratory was established inApril 2011. 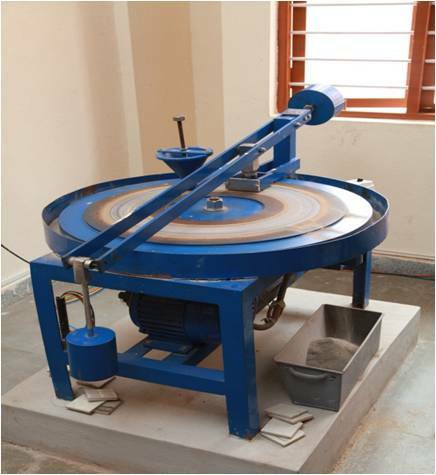 The Laboratory has equipments and facilities to cater to the needs of students to get hands on experience on testing of materials like tiles, aggregates, concrete blocks and bricks.The laboratory is extensively used by III semester Btech students as a part of curriculum also by final year Btech and Mtech students for their projects. The students will be able to independently perform tests to find out various properties of materials by acquaintance of this lab. Skills acquired by students: Quality control and Assurance of materials. Survey Laboratory was established inApril 2011. The Laboratory has all the latest and advanced instruments which can be used by students in getting acquaintance of survey works. 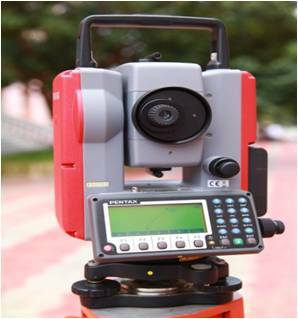 Total Station the newly procured equipment in 2013 is state of the art, which meets the industry standards. 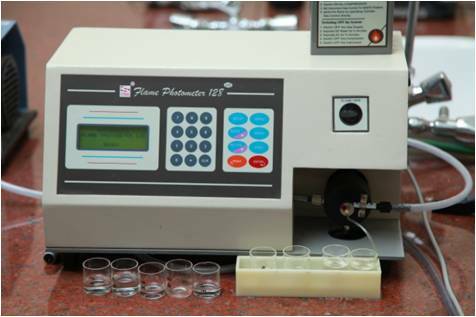 This laboratory is extensively used by Btech students of III, IV and VI semester. 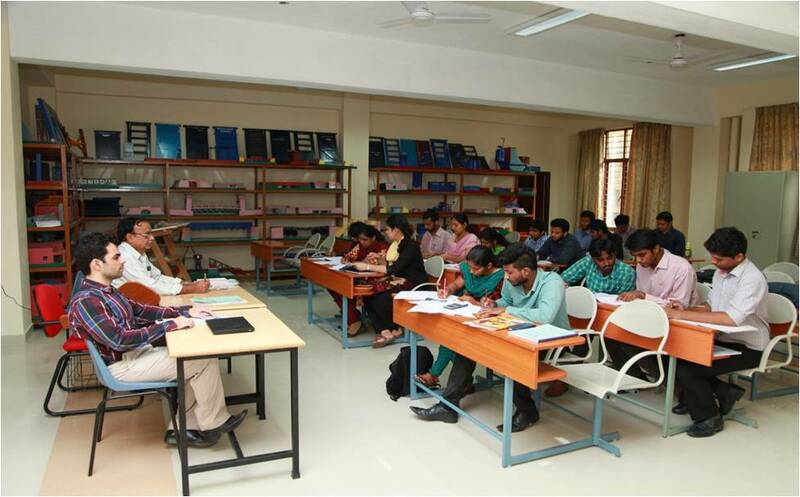 The students will be able to perform professional survey work in civil engineering works. Skills acquired by students: surveying. Survey Laboratory Major Equipments: Total Station, Auto Level, Planimeter etc. 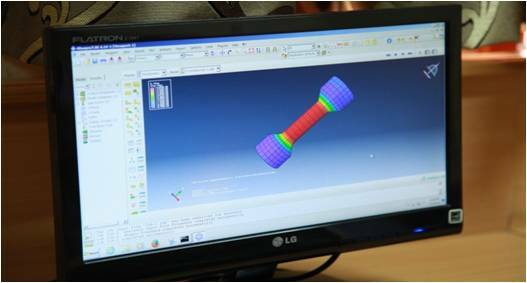 Computer Aided Design Laboratory was established in April 2012. It maintains windows based computers used for course work, teaching, design and research work. Commercial Software packages like AUTO CAD, STAAD Pro, E-Tabs, Auto Plotter, Road Estimator are available with user manual and It is used by Btech V semester and Mtech I semester students as a part of curriculum and for others as a part of design and project works. The students will be able to draft plan andelevation of buildings and independently model and analyze structures. 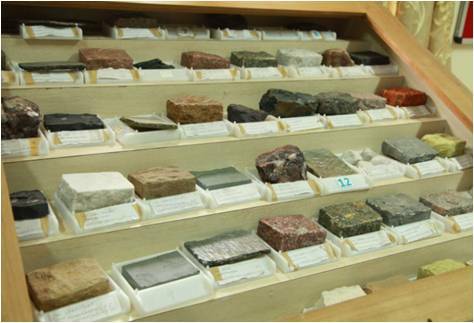 Applied Engineering Geology Laboratory was established in April 2012, it has a large collection of various rock mineral samples from various places used for studying and identifying different type of rock minerals. The Laboratory is used as a part of curriculum by V semester students. 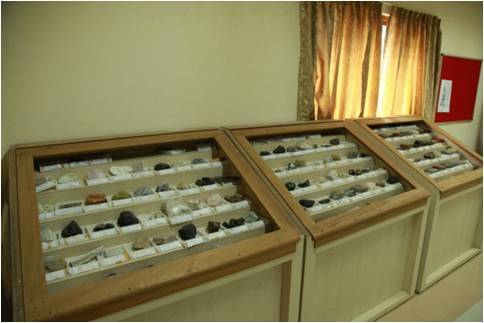 Geotechnical Engineering Laboratory was established in July 2012.Laboratory has equipments used to study and determine various index and engineering properties of soil. The equipments meet the standards for teaching andbasic research purposes. 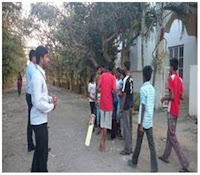 Students of Btech VI semester use the Laboratory for curriculum and also by other students for their project works. The students will be able to classify the soil, find out soil parameters used for design and construction, and apply modern techniques, skills necessary for engineering practices. Skills acquired by students: Testing on soil for its properties. Geotechnical Engineering Laboratory Major Equipments: Triaxial Shear, Direct Shear, Unconfined Shear, CBR Testing Machine etc. Highway MaterialsLaboratory was established in May 2012. It has all facilities catering to the needs of curriculum and few of the equipments can be used for basic research purposes. 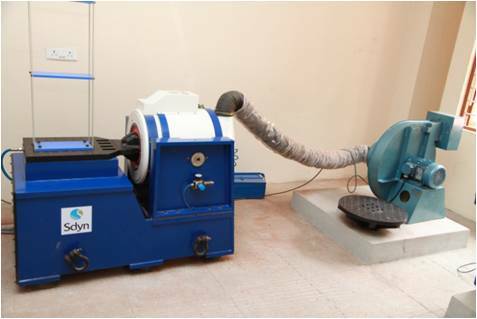 The materials like bitumen and aggregates can be tested effectively. Students of VII semester use the laboratory for their curriculum and other students for their project works. The students will be able to determine properties of bitumen, aggregate and hot mix asphalt testing. Highway Materials Laboratory Major Equipments: Marshal Stability, Bitumen Automatic Compactor, Bitumen Ductility etc. Skills acquired by students: Material quality assessment. Structural Engineering Laboratory was established in December 2014. It was started for the advance study as a part of curriculum, projects and research for Mtech students. 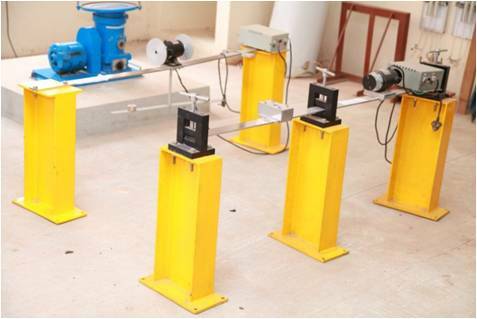 It has advanced equipments necessary for analyzing various loads and its effect on different structural elements. The students will be able todo independent dynamic analysis of single degree and multi degree freedom system. Skills acquired by students: Identifying dynamic loads and structural design. 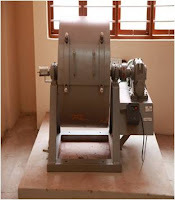 Structural Engineering Laboratory Major Equipments: Electro Dynamic Shaker, Vibration Absorber, Models for Simulation etc. Concrete Technology Laboratory was established in May2012.It is having facilities and equipments used for preparing and testing of different types of cement and concrete specimens which can be used for teaching, research and consultancy purposes. The Laboratory is housing block making machine which is extensively used for making ecofriendly blocks using the iron ore tailings from mines. 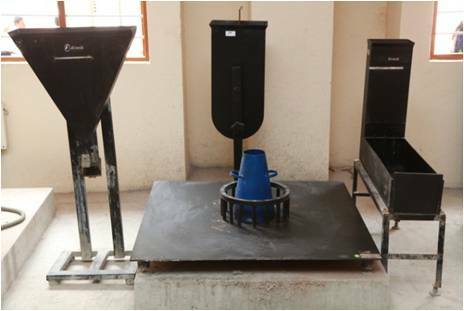 The Laboratory also has a specialized self-compaction concrete testing setup used in research works and mix design for different grades of concrete can be done. Laboratory is used by Btech VII semester students as a part of curriculum and other students for their research and project works. The students will be able to do concrete mix design and apply quality control techniques to test concrete quality and carry out test procedures and the principal laboratory properties of fresh and hardened concrete. Concrete Technology Laborator Major Equipments: Auto Clave etc. 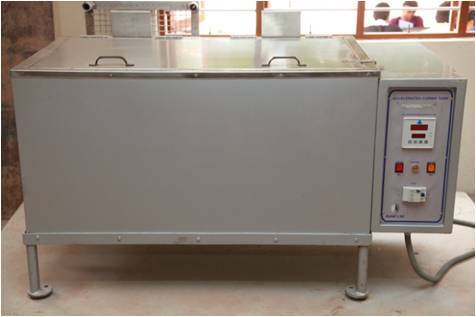 Environment Engineering Laboratory was established in January 2013; latest equipments have been procured, which can be used for studying water, waste water and microbial characteristics for teaching andbasic research. Some of the equipments like U. V. Spectro Photometer meet industrial standards.Laboratory is used by VII semester students as a part of curriculum and also for project works. Students will be able to analysis physical, chemical and biological parameters of the water and waste water. Environment Engineering Laboratory Major Equipments: BOD incubator, Muffle Furnace, U.V. Spectrophotometer etc. 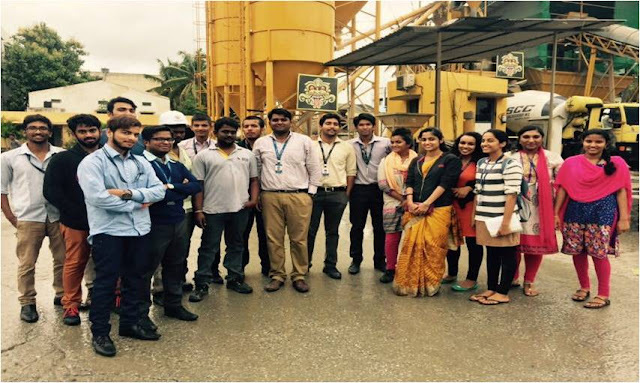 A site visit was organised to SCC RMC Plant on 21 and 22 June, 2016 for VII sem and V sem B. 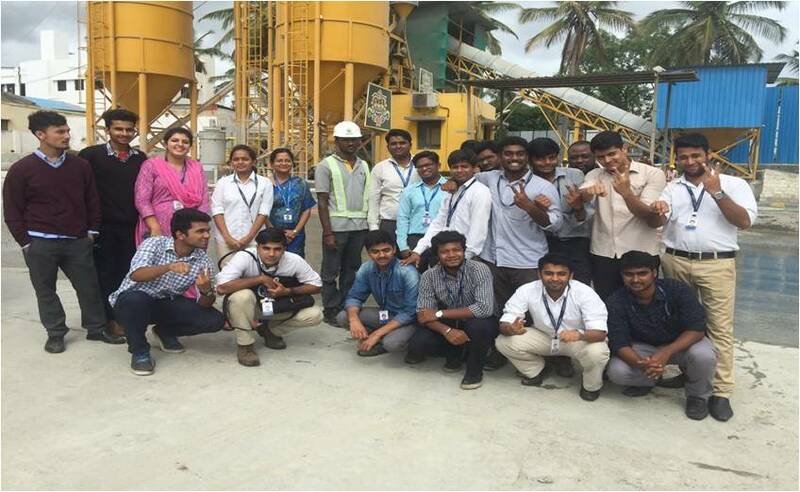 Tech Students respectively accompanied by five faculties, to make students familiar with various equipment’s used, batching of concrete, materials used and its quality checking. Mrs Sunny Gungho from The Royal Institution of Chartered Surveyors delivered a talk on careers in built environment. The students were made aware of the opportunities available to them immediately after their graduation in the field of construction management and built environment. The talk was attended by all the final year students of B.Tech, M.Tech and 3rd year B.Tech. 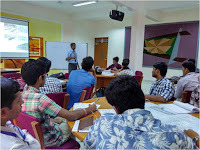 The Department of Civil engineering in association with A N Prakash Construction Project Management Pvt Ltd conducted in house summer internship “Being Employable” for 15 days between April 15th to April 30th for the students of 2nd year, 3rd year B.Tech and 1st year M.Tech. Close to fifty plus students attended the internship program. The students were extensively given insight about all the responsibilities of a civil engineer in a construction project namely quantity surveying, site monitoring, quality assurance, quality control, structural engineering, building services, project management etc. 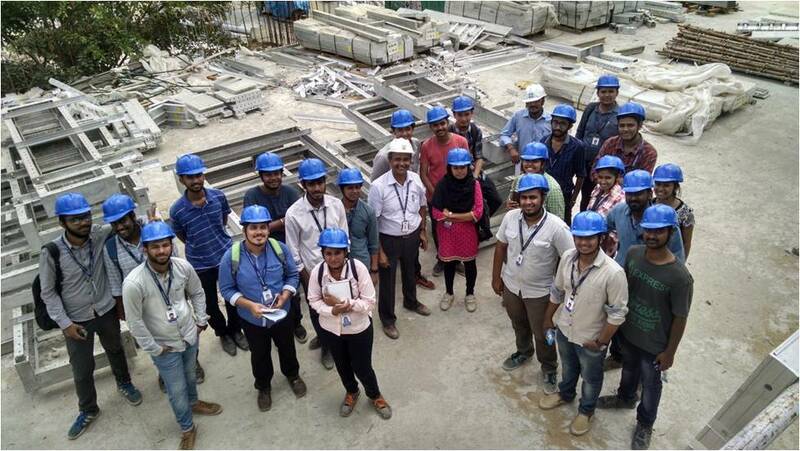 On 26th April, as part of the internship program the students were taken to a site visit to Brigade Panorama where the students spent an entire day learning various stages of construction. The students got an opportunity to visualize the aluminum form work construction. They also visited the RMC plant housed inside the premises of Brigade Panorama. On the last day of the internship, Mr. A N Prakash, Managing Director of the ANPCPMC Pvt Ltd delivered a talk on innovations in construction technology. After the completion of the 15 day internship program the students were asked to complete another internship for 15 days at a site of their choice and prepare a presentation. The students presented their experiences and the presentation was evaluated by the team. Students were issued certificate of merit based on their overall performance during the internship. The A N Prakash team appreciated the enthusiasm shown by the students during the internship and ensured they are willing to conduct more such programs in future. The internship was first of its kind in the department and was highly appreciated by the students. 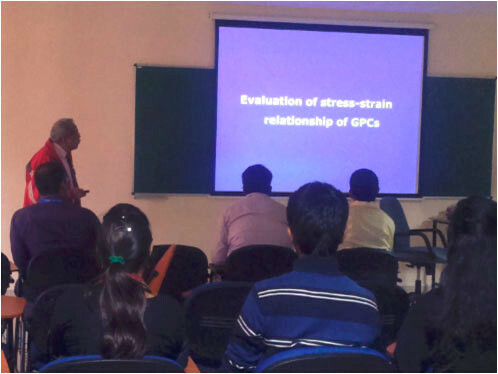 Dr. Rajamane delivered a talk on Geo polymers and its applications in the field of civil engineering on 13th November 2015. Dr. Rajamane shared his rich experience of research on geo polymers and enlightened the students about its mechanical and chemical properties creating an interest in both students and faculties to continue the research in field of geo polymers. 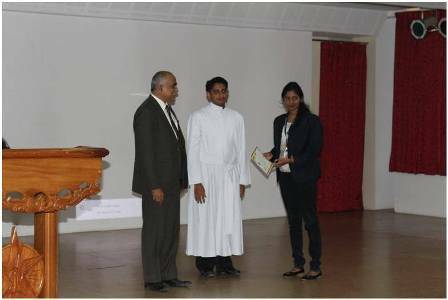 The department of civil engineering inaugurated the Christites Association of Civil Engineers for the academic year 2016-2017.The session started with an invocation by the students. Prof.Raghunandan Kumar, Coordinator, Civil Department welcomed the gathering. Mr. Arjun.H.R, Student coordinator announced the office bearers of the students association for the academic year. 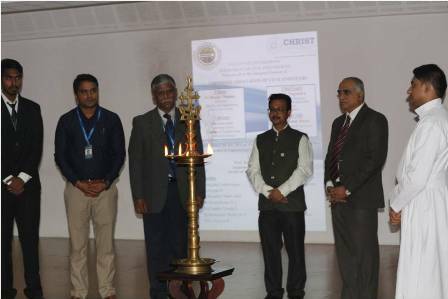 Dr. R. Nagendra, Technical Director, Civil Aid Techno Clinic Pvt Ltd, Bangalore was the chief guest of the event. He delivered a talk on “Innovative Materials Developed For Construction Industry”. Another guest talk on“Advances InConcretre and Concrete Technology”delivered by Mr. KaushikHajra, Zonal Technical Services Manager, Aditya Birla Group. He also gave away an award for Ms. AshaShaji, student of 5th semester B.Tech, for scoring the highest marks in Materials of Construction. It was a highly successful event which was well appreciated by all the students and faculty members. 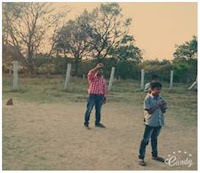 The Department of Civil Engineering organized a visit to the Child care center located in Hennur road, which is about 50 kms from Faculty of Engineering. The Center is under ‘Freedom Foundation’ which is an NGO run by Mr. Ashok Rau.We started from the campus on the late afternoon of a Saturday at 13:30. As we embarked upon this journey, we were on one hand excited and on the other hand curious to know these children. As we reached, we saw many tiny smiling faces greet us. We met the Residential Councellor, Mr. Naveen who was stationed in the house 24/7 to take care of the children. 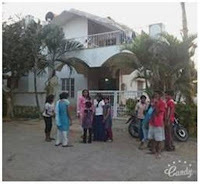 We learnt about the functioning of the NGO and also how the children were taken care of. There are 14 children currently in the childcare centre, and all of them are AIDS affected children. They live on drugs every day, since their white blood cells or T-cells which provide immunity to the body are weakened by the HIV virus. We began to interact with the children. First came in this little girl who is called D, who wants to become a teacher, then Mahalakshmi, who wants to become a doctor, Bhavana, an RJ, Vinod, an aeronautical Engineer, and other children with lots of hope. We also learnt that the foundation has seen one Ms. Anitha, who left the child care centre is now part of the AXA group working as an Admin Assistant. She comes once in 15 days to share with all memories of old. Altogether, this home looked lovely. It seemed that they have learnt to share their joy and pain, to accept each other as brother and sister, they were together as one, inspite of the social stigmas that they might face when people know the reality. Just a few moments with them left us with so many questions behind, yet convinced to live life with all its challenges. ‘When there are children who could be wondering ‘Why was I even born? – Am I who is bestowed with everything ought to complain about anything around me?’, ‘When there are children who cannot have personal attention-Am I, who is old enough ought to think only about SELF and not about the neighbour?’, When there are these children who are so full of gratitude, Am I not forever indebted to God? Pictures of us interacting with the children. Memories are the best pictures taken.